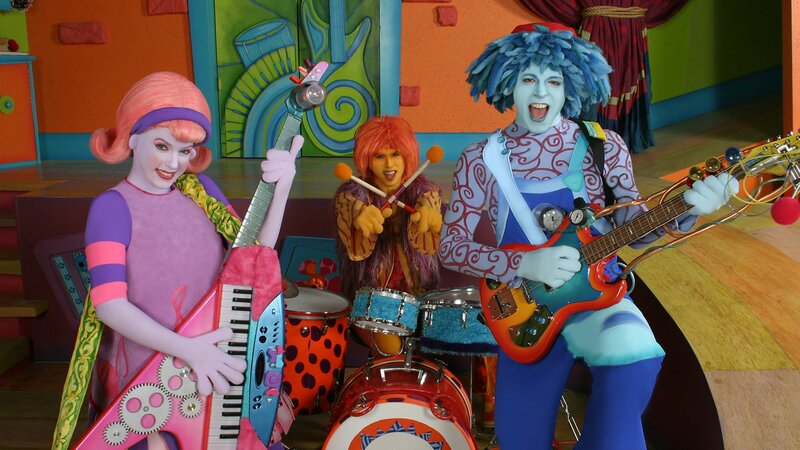 Colorful pop band The Doodlebops encourage kids to dance and sing along to their music. Geared toward preschoolers, Rooney, Moe, and Deedee Doodle also teach age-appropriate lessons. The Doodlebops argue over who gets to be on a magazine cover, before deciding that staying friends is much more important. Rooney has to practice, practice, practice, in order to learn how to play his new invention, the Honkophone. Moe has to overcome stage fright to perform his big solo. Rooney learns that it’s good to try something new because you just might like it… even if it’s cauliflower! The Doodlebops find out that everything’s better when you work together. Rooney and Moe are worried that Deedee’s new tap shoes are magic, and will make her dance forever! Rooney is watching out for a very rare bird, and learns that persistence pays off. The Doodlebops go all out to keep their promise to write letters to all their fans. Rooney’s new invention puts Moe into ultra-slow-motion and he has to figure out how to speed him up again. The Doodlebops ask for help from their friend Jumpin’ Judy. There’s a storm and the lights go out; the Doodlebops learn to face their fears. While playing at being a queen Deedee gets a little carried away bossing Rooney and Moe around. When Bob’s bus breaks down the Doodlebops resort to many different kinds of transportation to get to their gig. The Doodlebops babysit a lost puppy before returning it to its owners. Moe learns about the joys of reading. The Doodlebops go in search of high and low sounds for their new song. The Doodlebops have a crazy, mixed-up, backwards kind of day. The Doodlebops learn how to cope when things go wrong. Rooney and Moe want to give Deedee the ultimate, perfect birthday gift. Rooney proves that you can learn all sorts of valuable things from asking questions. The Doodlebops go on a dinosaur hunt. Moe wants to grow up right away, but realizes that he just has to be patient. Deedee has trouble learning some magic tricks, and makes Mudge disappear. 24. What Did You See Today? The Doodlebops can’t think of a topic for their new song. The Doodlebops have fun playing music – without their instruments! The Doodlebops set out to put a smile on Mudge’s face.